Today is a friend's birthday, and I'm baking him a cake. Well, really, I'm baking him a cake and one for Alex and I, because there's nothing worse than baking someone a cake and not being able to taste it and make sure it came out OK. So we'll eat ours for dessert tonight, and deliver his tomorrow. 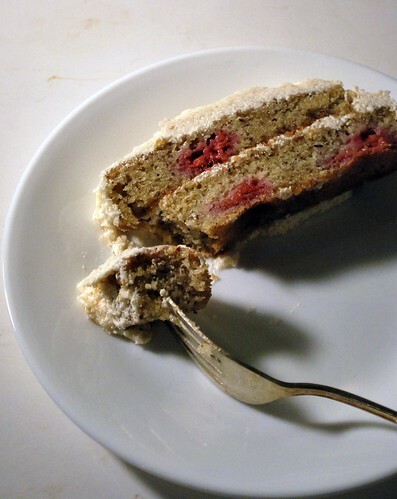 I was going to make some elaborate tart, but opted for this easy cake. I used almond meal and some almond extract, because I was craving something almondy. 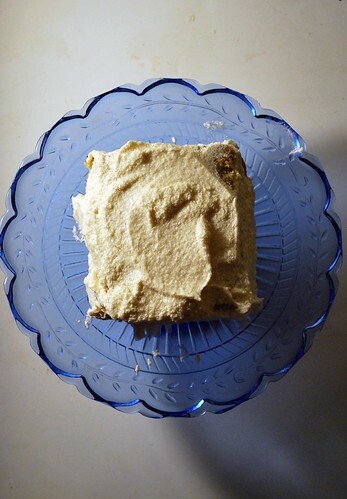 Then, because I really wanted some, I made a quick vanilla buttercream. I made two small two layer cakes, and yum! I'm not going to post a buttercream recipe, but there are a billion on the web. Or just beat some butter with a whole mess of powdered sugar and vanilla, maybe a splash of milk. Preheat oven to 400, and lightly grease two loaf pans (or one 8x8 pan). In a small bowl, combine the almond meal, rice flour mix, xanthan gum, baking soda, baking powder, and salt. Cream the butter and 2/3 c sugar together well, then add the vanilla and almond extract, then the egg. Add the flour and buttermilk alternately, starting and ending with the flour in three batches. Divide the batter between the two pans. 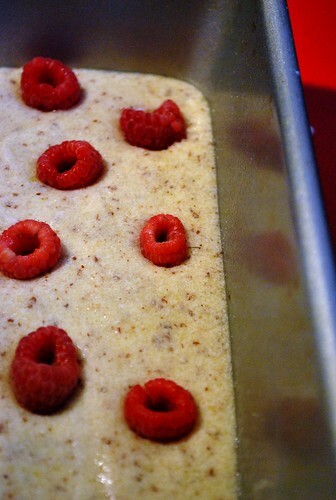 Place the raspberries around in the batter, then sprinkle with the rest of the sugar. 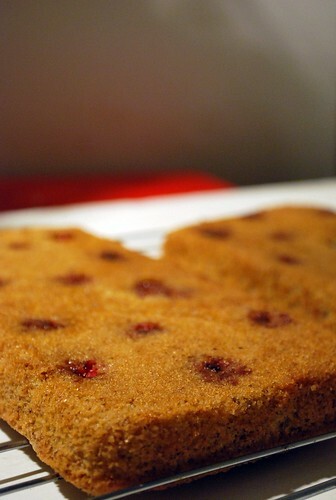 Bake the cakes for 20 minutes, until browned around the edges and firm in the center. Cool in the pan 10 minutes, then remove gently to a cooling rack and cool to room temperature. This sounds so good! Going into my pile of "what gluten-free cake will I make for my birthday" recipes! I've seen that cake but not with a frosting! Brillant idea! Frosting makes everything better! Oh, and the almonds? Yum! Ooh la la! That looks lovely. I adore raspberries. Nice addition of the almond meal! I have become a huge fan recently of almond meal pancakes.